What size time capsule do I need? In 2014, we made an info-graphic that we hoped would help you choose a time capsule. How do you determine what size you need, for instance. Here is one way to begin your search for the perfect size. Prices are subject to change, so please see our current website for the most current info. You can also access a handy printable catalog from our site, and we change that often. First, determine ‘Whose Time Capsule?’ it is. Is it personal or family, or is it a larger group? The larger group could be a school, a church, a company, or a government activity. Look at the ranges of capsules ordered by these groups. Next, figure your specific budget. How much can you spend on the time capsule project and what is it for? The first column shows prices for the time capsule container. 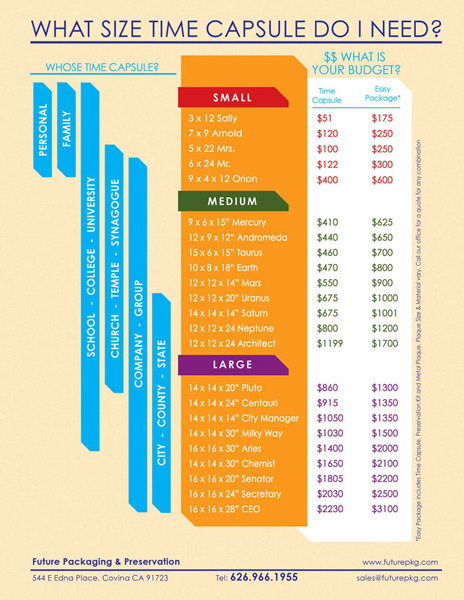 The second column shows the Easy Package price. The PKG includes time capsule + preservation kit + cast plaque.You might only want the time capsule, or you might want the whole time capsule package. Let’s say you are a church (temple, synagogue). Common time capsules for this category fall in the ‘medium’ category. That means the Sally is likely to be too small and the Aries too large. Now, how much money? If your budget is $800, consider the Earth Capped Time Capsule PKG (10x8x18? in size). For about this amount, you get capsule + kit + plaque. 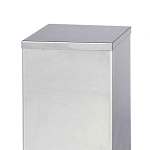 But if you only need the time capsule container, your $800 will buy a larger size. About $839 will get you a larger time capsule – in this case the amount is close to the 12x12x24? Neptune Capped Time Capsule. Of course these prices will change over time, but the relationship will remain the same. Pricing may change, too, if you need a bronze vs aluminum plaque. The list is not all inclusive. 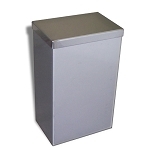 We have more than 20 sizes for time capsule containers. We have more than 5 different preservation kits. And we have more than 20 plaque sizes (and then choose either a Bronze Plaque or an Aluminum Plaque). But with this chart and our chosen packages, you have a place to start. It gives you an idea of which ones to choose via size and pricing. What's average? 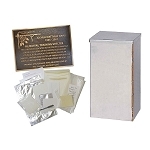 The most popular size is the 12x12x12" Ganymede Package that includes a Basic Preservation Kit and an 8x10" Plaque. You can get a surprising amount of items into the 12x12x12" size time capsule, and you can usually fit your message onto an 8x10 plaque if you are not too wordy. 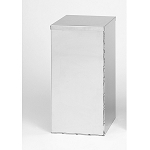 For more detail on all products see our main catalog, Archivally Speaking. It’s easy to print out just the pages you need and discuss things to consider with others on your time capsule committee. We make up the Easy Packages from the items in the catalog. We had to choose what to give you in any one package. For instance, it’s possible to get the small Sally Time Capsule with a larger plaque than the 7x5" (or 5x7"). But the smallest Sally Package has that size aluminum plaque chosen for you already. But hey, it just takes us a day to figure a custom package for you. Just request it by email or give us a call (we will reply by email so include contact and address info if you want a quote). Please note: You must order all 3 things at once to get the Easy Package or PKG discount. Also, because there is a discount for purchasing all 3 items, you must finalize your plaque with us within 30 days after your order. Ships promptly! 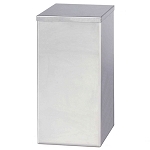 Time Capsule Box holds up to 450 or more documents, photos & artifacts safely. Ships promptly (1-2 days).